Beyond Anger Management: Master Your Anger as a Strategic Tool is an easy to understand guide which picks up where typical anger management books end. It explains what your anger is and why you have it. 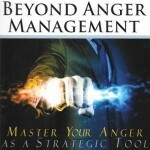 It shows you how to identify and master your anger and empowers you to apply your anger as a strategic tool. You will learn how to know when your anger isn’t genuine but is covering over other feelings as well as how to deal strategically with someone else’s anger directed at you. Beyond Anger Management: Master Your Anger as a Strategic Tool is for you if feel your anger controls you and you want to learn how to master and strategically apply your anger. This guide is also for you if you want to learn to effectively deal with others whose anger controls them.